An advanced swiveling mechanism allows for easy spinning while the frame will stay perfectly stable. 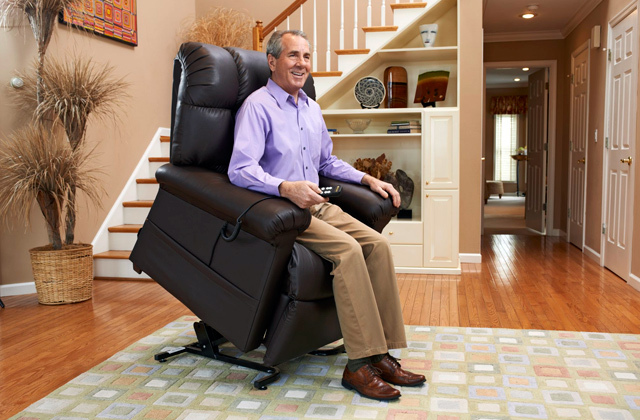 Even if used daily, the chair won't get loose or wheeze and requires no specific maintenance or oiling. The pillow goes flat rather quickly. This Papasan chair is one of the best on the market, thanks to its sturdy and reliable design thought out to every tiny detail. A strong and stable frame perfectly combines with elegance of the decorative wickerwork. 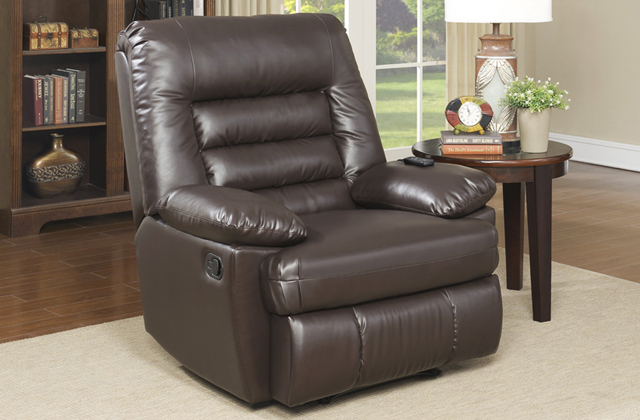 A soft button-tufted cushion will immediately get you hooked by providing the ultimate relaxation. Microsuede fabric is very practical and easy to maintain: even if you stain it, you can clean it by simply wiping it with a damp cloth. Besides, the manufacturer has put a larger amount of the filler inside to give a seat a more welcoming look. The legs might scratch the flooring. Due to its large dimensions, this model is best suited for large households with vast open areas. It will comfortably accommodate people of all sizes while an easy-to-assemble construction makes installation a real snap. The construction of this model includes a top-quality mechanism to prevent accidental chair folding, which is a highly important point in terms of safety. At the same time, non-skid feet ensure extra stability on any surface. Faux fur requires a more thorough care. This model stands out among its counterparts for the one-of-the-kind collapsible construction. When you don't need the armchair, you can fold it down in just a few seconds. It's a real find and a perfect match for small areas and rooms limited in space. Twill fabric boasts a special fiber structure ensuring increased durability and resistance to wear and tear. Subject to careful use, it won't rip and lose its appealing look even under extensive daily use. Rattan frame is prone to scratches. 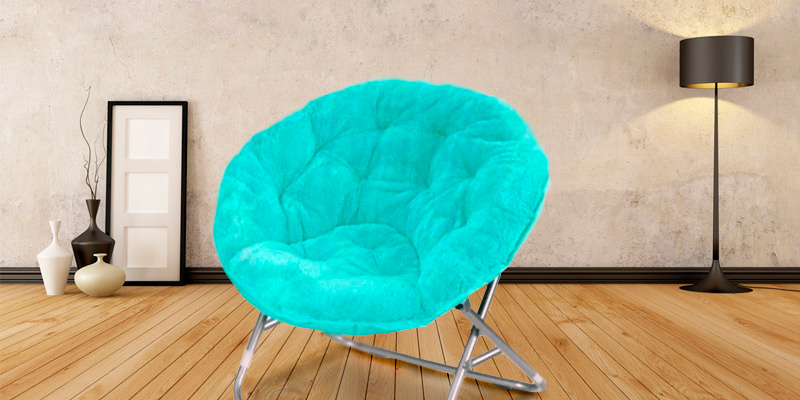 This Papasan chair from International Caravan will become your favorite place to chill out. With 42 x 42 inches of overall dimensions, you'll have a large and comfy seating for reading a book, watching TV, or simply having a nap. The frame is made of robust steel resistant to deformation and corrosion. Thus, you are free to use the chair even outdoors in your garden, patio or on the open terrace with no fear of it getting wet in case of rain. Might be a bit uncomfy for larger people. This model is distinguished by a thought-out combo of relatively small dimensions, lightweight design, and a foldable construction that allows it to fit in tight areas where every square foot counts. It's a worthy alternative to bulky armchairs and the best pick for those limited in space. 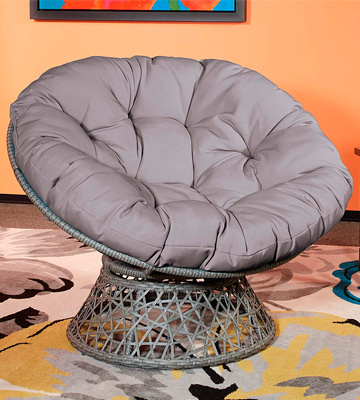 This Papasan chair from OSP designs will become your favorite the moment you sit in it. This model features a button-tufted cotton pillow stuffed with polyester polyfill. It is made in a neutral grey color that will fit into any interior. Unfortunately, some users claim the pillow is prone to go flat. Yet, we're sure it will serve you well before this problem occurs. Plus, you can always purchase a new one in a different color. You will be able to refresh your home interior design once in a while without replacing your chair completely and thus, save some money. 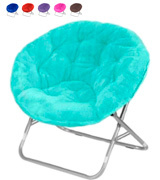 For better comfort and convenience, the chair has a 360-degree swiveling sturdy base. It will ensure a bit more mobility without the need to get up. The frame is made of steel and can hold an average load of 200 lbs, so, the model is suitable for kids and average-weight adults alike. But what we like the most is that it features decorative woven resin wicker on the bottom that adds elegance, specific exquisiteness, and lightness to the overall chair design. With the OSP Designs Papasan Chair, you can choose the most comfortable position and leisure in comfort. Its well-thought-out and stylish design won’t leave anyone indifferent. If you are a happy owner of a large house with spacious rooms and vast rest areas and want to fill the space with something comfortable and easy-to-maintain, the International Caravan Papasan Chair is definitely the way to go for. Encased in a hefty design, this item boasts pretty big dimensions (42"W x 42"D x 35"H). 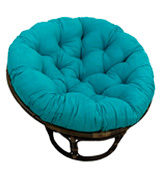 Generously sized and completed with a funky aqua-blue cushion, it makes a perfect rest spot to nestle in comfort and will add a nice accent to your room. The cushion is made of microsuede fabric that is nice to touch and very easy to maintain: even if you stain it, you can clean it without a hassle by simply wiping it with a damp cloth. 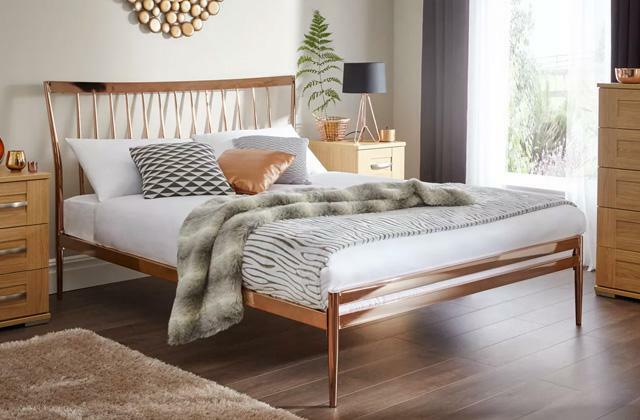 On top of that, the manufacturer states that it has a generous amount of the poly-fill filler inside to ensure maximum cozy feel and further enhance your comfort. With that said, you can not only leisure in a chair with a cup of hot chocolate but also have a nap wrapped in a soft blanket. The cushion seat of this Papasan lounge chair is supported by a dark brown rattan frame distinguished by excellent stability. The only problem with this model is that the legs may leave scratches on the floor. That’s why we recommend putting it on the carpet or move it with added care when needed. All in all, the International Caravan Papasan Chair is a high-quality piece of furniture that will find its place in pretty much any interior. 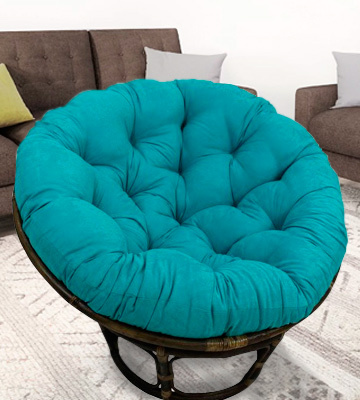 Arguably, it is one of the best Papasan chairs for large rooms that will bring new colors and extra comfort to your home. 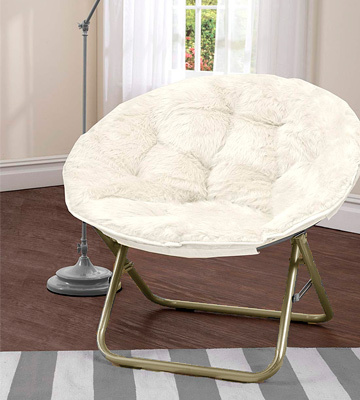 The Urban Shop Papasan Chair should be your top choice if you’re looking for a functional and stylish piece of furniture for a small apartment. What makes it stand out among its rivals is a collapsible construction and lightweight design. Being more than twice lighter than other models in the range, the Urban Shop chair is pretty compact and highly portable. 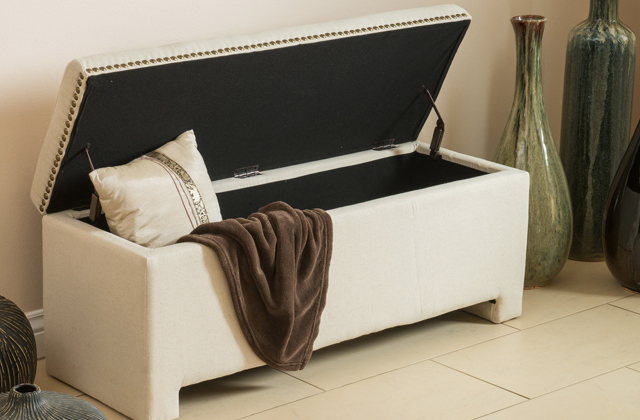 The metal frame pops up and folds down in seconds making this model easy to set up and convenient to store. Just take it out in the evenings to watch TV or read a book in comfort and fold it back when not in use. Despite small dimensions and light weight, the chair can carry the weight of 225 lbs that is comparable and even a bit more than the weight capacity of fixed-frame models. The item construction includes a high-quality locking mechanism that prevents the chair from accidental folding and ensures your safety while sitting. What is more, the non-skid feet provide extra stability on any surface. The other great thing about this folding model is its lovely cushion. 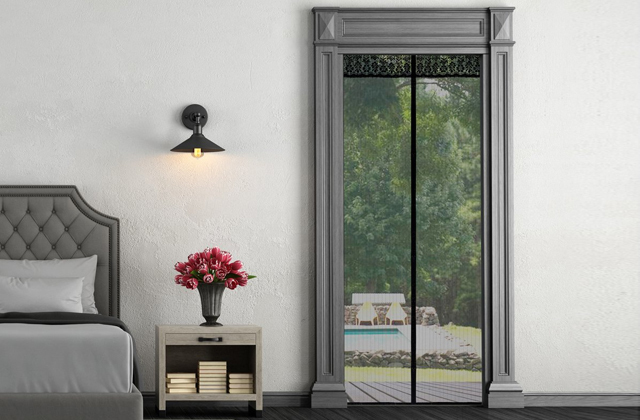 It comes in a variety of colors (white, red, black and others), so, you can choose the one that will best suit your home decor and your individual preferences. 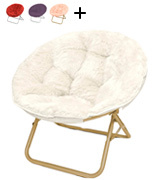 Stuffed with a soft polyester filling and decorated with a faux fur top, it creates a cozy and welcoming seat. However, bear in mind that it will require thorough maintenance to look nice and clean. 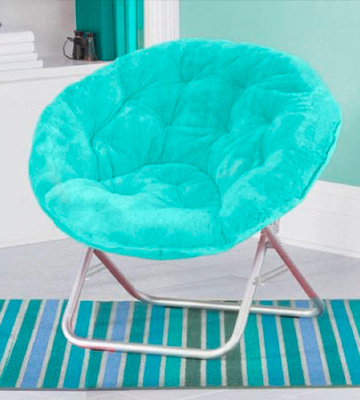 In conclusion, if a mini Papasan lounge chair for a small room is what you need, this model from Urban Shop is your top pick. 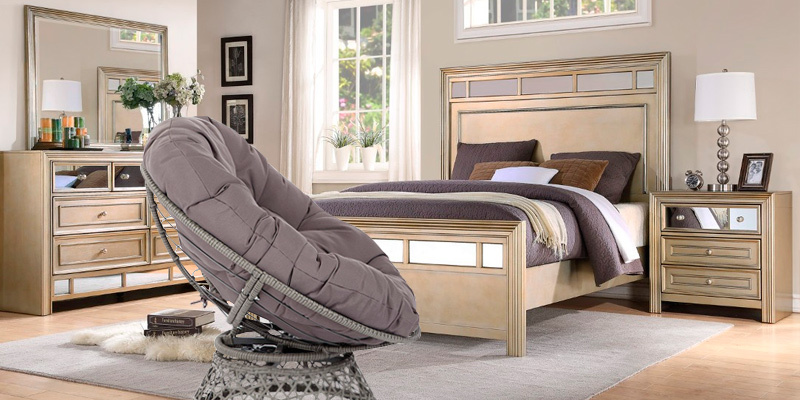 It is foldable, lightweight, and extremely comfortable. Furnishing a lounge area, restroom, or leisure spot in your household? 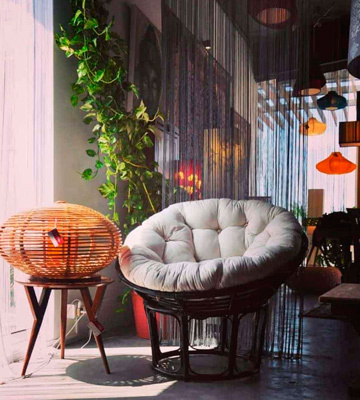 Add the International Caravan Rattan Papasan Chair to your interior and it will become your favorite place to sit and chill out after a long working day. This model boasts rather large dimensions (42 x 42 inches), hence, you can take the most comfortable sitting or half-lying position to read a book, watch TV or have a nap. The chair frame is made of rattan and bowl-shaped to provide extra stability and sturdiness on soft and hard floorings. 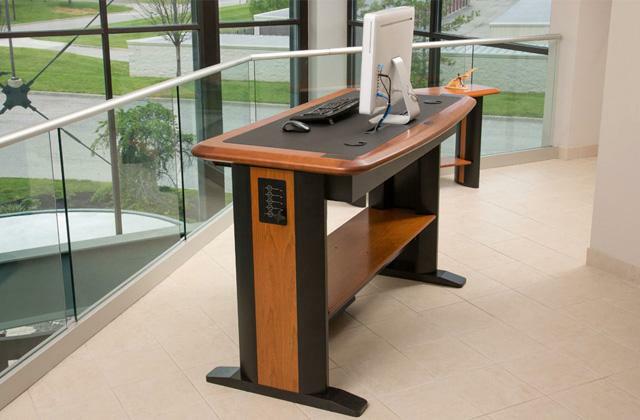 However, we strongly advise you to be careful in use since support legs might leave scratches on wooden and laminated floors. The armchair comes complete with a large white pillow made of twill fabric and generously stuffed with filling for added softness. The cover fabric features a special structure of fibers making it durable and resistant to wear and tear. Under careful use, it won't rip or lose its appealing look during the whole service life. That’s why, when purchasing this item, you can be sure you are investing in a long-lasting product. 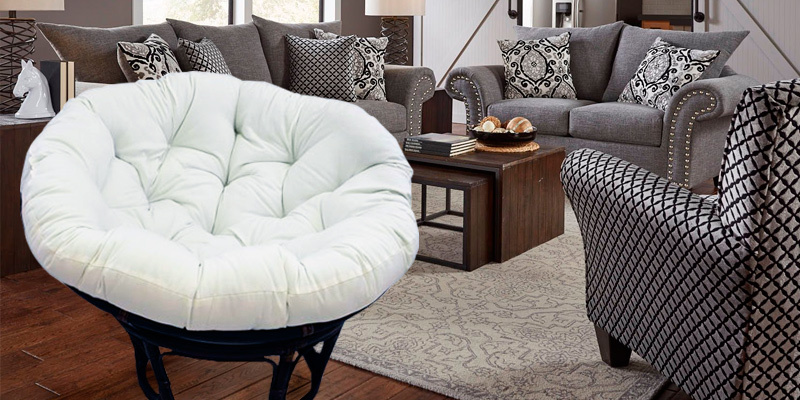 One more benefit we can't but mention about this Papasan lounge chair is its fairly moderate price allowing you to enjoy the comfortable rest without costing you an arm and a leg. In short, the International Caravan Rattan Papasan Chair is a capacious and affordable option for a living room or leisure area that will quickly become your favorite rest spot. 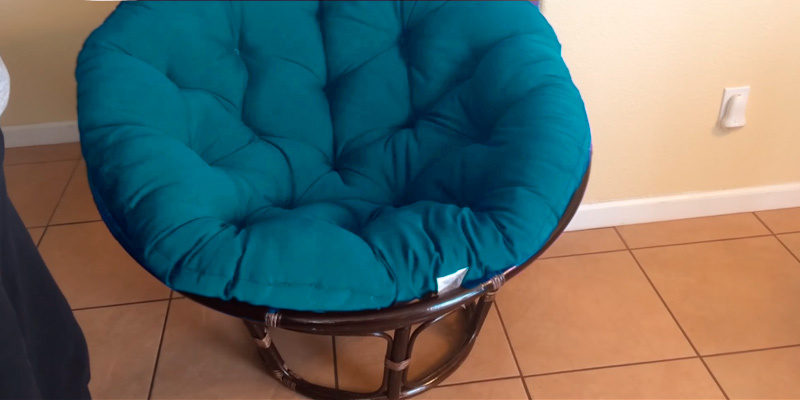 This is by far the best Papasan chair for indoor use you can find for this money. 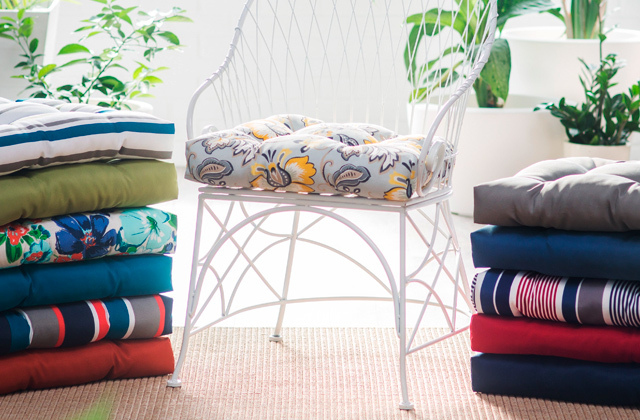 If you want to relax during the evenings in your garden and enjoy some fresh air, we recommend taking a closer look at the Mainstay Papasan Chair. This model is perfectly suitable for your patio, and here’s why. Not only does it have decent dimensions, but it is also equipped with a sturdy metal framework. Made of stainless steel, the frame is rust-resistant and fears no moisture or damage. A soft polyester cushion on the top will create a comfortable and cozy seat to have a good time with friends or simply lounge outdoors. Since the cushion fabric is not water-resistant, we recommend you to refrain from leaving it outside while the frame can easily withstand inclement weather. 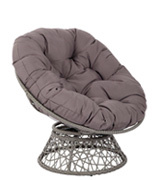 What is more, this Papasan lounge chair is a good choice for small apartments. It combines a thought-out lightweight design and a foldable construction, which makes it a great alternative to bulky yet not always comfortable armchairs, couches, and sofas. Surprisingly, despite the lightweight design, the chair boasts an impressive weight capacity and is able to hold the load up to 225 lbs. The only thing that is not so good about it is a cushion: it is quite small and might feel inconvenient for larger people. Other than that, you'll absolutely love the array of festive cushion cover designs available. From bright pink to scarlet red to aquamarine to turquoise and zebra pattern, the chair is offered in many bright, eye-catching color options to suit any taste and interior style. To sum it all up, the model from Mainstay is definitely a great option for outdoor use. It is rust-resistant, sustainable and is able to carry a pretty heavy weight. Plus, thanks to a foldable construction, it is easy to handle and store. So, if you want to bring some extra comfort to your patio, you can safely give the Mainstay Papasan Chair a shot. If you decided to renovate your old interior or simply want to add something new to your house, take a closer look at Papasan chairs. 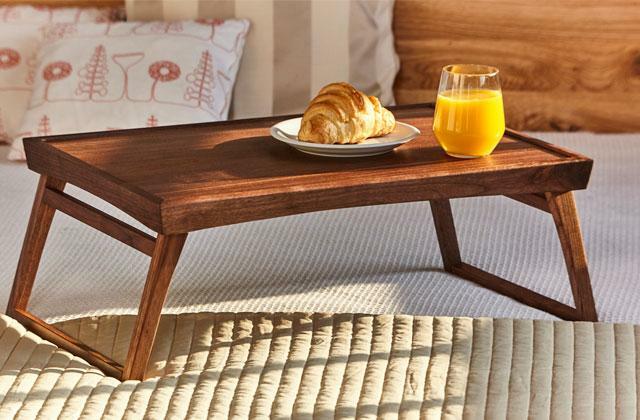 These pieces of furniture are irreplaceable when you feel like relaxing with a book or a glass of your favorite beverage in your lounge. Being extremely popular back in the 1950s, these armchairs continue to stay in demand nowadays, thanks to their funky design and the ultimate convenience. 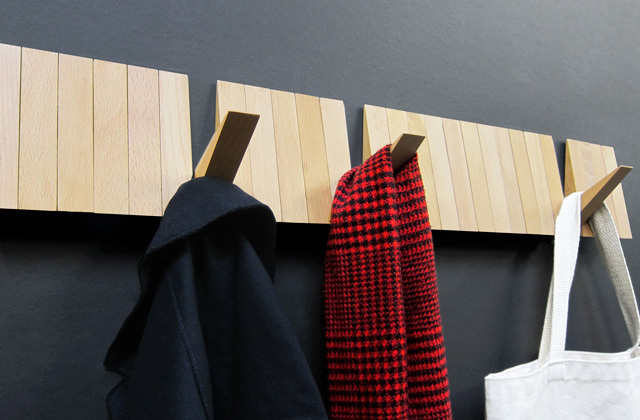 Other than that, they are versatile enough to fit in most modern style interiors. 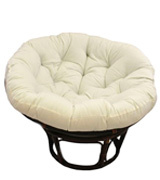 A Papasan chair consists of a stable base and a comfy round cushion. Due to their shape, they're also called moon or bowl chairs. 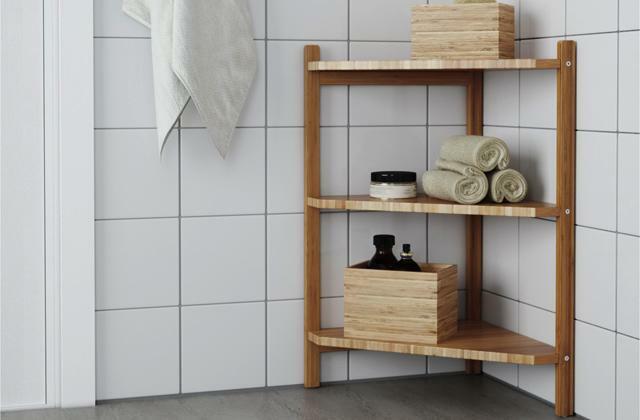 Originally, the base was made of natural wood, wicker or bamboo, but today you can find a lot of other bases produced from such flexible yet sturdy materials as plastic and metal, which makes them significantly cheaper. For more convenience, the base is usually rotating, so, you can easily turn in your cozy nest. The cushions come with a soft filler inside and can vary in diameter to deliver comfort to users of any size. While Papasan chairs are obviously designed for comfortable rest and lounging, office chairs and computer desks will add convenience to your working space.